A small car with distinctive design, and a rich brand history -- that’s MINI. 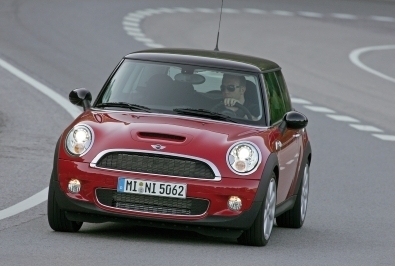 MINI, a brand owned by the BMW Group, has been on my funky brand radar screen for a while -- I mentioned it on my blog back in 2009, in my post On cute little brands and MINI. MINI fits my Schmoozy Fox’s description of Funky Brands very well, as it owes its market success to a combination of outstanding design and smart brand strategies. An important part of MINI’s brand vision throughout the years since its launch in the 1950s has been careful nurturing of the fun and excitement factors, which are inherent to MINI’s brand DNA. Today, I am happy to bring to you an in-depth story about MINI, told by my interviewee Philipp Thomssen, Head of Advertising and Community marketing at MINI. Take a glimpse at what MINI’s brand managers have done in order to reinforce the car’s emotional appeal to its customers around the world. Olga: The brand of MINI celebrated its 50th anniversary in 2009. How does a brand with such a long history manage to stay contemporary? Philipp: Launched in 1959, revived and reinvented in 2001, MINI has quickly evolved from a one-model niche player into a premium car brand with a diverse portfolio. In 2001 it was important to refresh the potential of the classical MINI, to make it a modern product and to build a strong brand by focusing on its emotional appeal. In the worldwide perspective it was necessary to position MINI in a coherent way as an independent brand, whose core was about excitement. The market introduction´s basics endure till today. The premise was to link an outstanding product with a modern design which still takes up the old iconic character of a MINI. Our product is characterized by its emotional design, outstanding product substance and progressive technology, and agile driving behavior as well as his almost unlimited options in customizing the car. A further significant point is maintaining the right balance of continuity of a brand now going back 50 years and its innovative potential. It was a challenge to position MINI as the first premium brand in the small car market. This was achieved by a consequent brand management and highly motivated team. Olga: How could you summarize the main characteristics of the MINI brand? Philipp: A MINI is more than a car. It is like a friend! It is pure “Excitement”. MINI is positioned worldwide as a unique and fully independent brand in its own – a brand revolving around the concept of enthusiasm and thrilling lifestyle. Our communication allows us to position MINI in a coherent way – worldwide. The marketing and communication strategy is characterized by the alignment as a premium brand with an international positioning and a clear orientation towards the demands of our existing customers and extended target groups. Olga: What is a profile of a typical consumer of MINI cars? Philipp: MINI aims to take over new target groups in modern milieus. Those tend to be well-funded, very demanding based on a very individual lifestyle and their part of the population is growing. The consumers are mostly 25 to 45 years old and work in a creative environment. They are open towards new trends and are spontaneous. Aesthetics and design looms large for them – in purchases decisions as well as in their daily life. A MINI is not a status symbol, but an expression of personality. It´s not about the size, it is about the substance and individuality. MINI is a car build for an urban area, no matter what country they live in. Olga: Does MINI have a “nationality”? Is it positioned as a German car with British heritage, or is the origin irrelevant in MINI’s brand positioning? Philipp: Today’s MINI is not imaginable without its British origin and heritage. MINI has always been a British car and still today there are cars produced in the so called MINI Production Triangle (Plant Hams Hall, Oxford and Swindon). Of course MINI as a brand is managed in Germany. But beside these facts we understand and steer MINI as an international brand. Olga: What are the countries in which MINI is especially popular? Philipp: In 2012 the U.S. of America has been the biggest market for MINI with 19.911(+6.0% compared to 2011) sold units till April. In Europe the UK (13.169 units) and Germany (12.385 units) registered the biggest sales. A plus of 25% in sales made China an exceptional market with already 6.911 sold MINIs. Olga: What are the factors that explain phenomenal success of MINI around the world? Philipp: On the one hand, it might be explained by the fact that the audience is very similar all over the world. Hence this international identity offered a chance to position MINI worldwide in a very coherent way. On the other hand, the success of MINI can be explained by its emotional attraction and the nuanced product line-up. In the long term we aim to offer up to ten different versions of MINI, in doing so we want to grow at a steady and sustainable rate. Olga: What MINI models exist now, and are there any plans to launch new models, or limited editions? Philipp: There are six MINI models right now (Hatch, Convertible, Clubman, Countryman, Coupé, Roadster). The seventh family member, the MINI Paceman will debut in Fall 2012. Our sub-brand John Cooper Works, which has its roots in racing, currently offers five models: The MINI John Cooper Works, the MINI John Cooper Works Convertible, the MINI John Cooper Works Clubman, the MINI John Cooper Works Coupé and the MINI John Cooper Works Roadster. Later this year, the MINI John Cooper Works Countryman and the MINI John Cooper Works GP will be introduced. As MINI is committed to the environment and sustainability we launched the MINI E global test-fleet back in 2008. Test-user all over the world have helped us to improve our first MINI powered only by electricity. Olga: Could you share some of the marketing activities in 2012-2013 that you plan to carry out to sustain and grow the brand of MINI worldwide? Philipp: There are more exciting brand activities to come. MINI will surprise with creative launch campaigns in those communication channels that we consider to be more and more important. In this context we will focus on online communications and social media, without ignoring the classic communication channels, such as advertising, commercials, sponsoring and cooperation, guerilla-marketing and others.